Children change and therefore as educators we must morph and adjust to meet their needs and ensure they learn, grow, and become successful. To that end, MAE Has a FACELIFT! Because there are always things to learn — ways to grow — TAEA offers the tools in its series on the MASTER ART EDUCATOR. 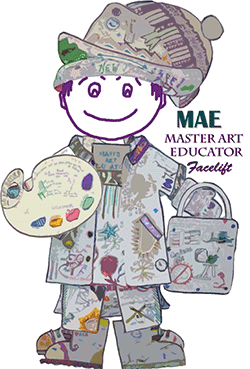 The Texas Art Education Association offers its MASTER ART EDUCATOR Strand, created to provide members successful tools. The profile includes 10 essential attributes or topics. When these are absorbed, adopted and implemented as needed — in part or in whole — they will enable art teachers to find real success in their classrooms and real joy in their profession. They can also serve as examples to other content area teachers because educators in the fine arts are blazing the trail of authentic learning for children. This is true integration. Are you a brand new art educator? Are you an art educator with alternative certification? Are you an art educator looking for a specific solution? Are you an art educator in search of all the tools you can find? Are you in need of rejuvenation? If you answered "yes" to any of the above, come to the Annual Conference and thoroughly explore the depths of the Master Art Educator with us. There are 10 amazing Master Art Educators who will be guiding these sessions. So — come and explore this strand with us. It will lift you higher! Students observe their environment to reﬂect and demonstrate how art is part of everyday life. Encourages students to approach concepts with a new perspective to stretch their artistic growth. Gives positive feedback, support, and continues student mastery. Project designs to guide students toward becoming risk takers, problem solvers, and creative thinkers. Engages and learns technology (including apps & varied types of devices) from students and colleagues. Physical layout of the room is optimal for ease of movement and the encouragement of collaboration and collegiality. Students given choices within the creative environment. Offers the availability of different media/materials to expand their creative process. Art room/studio allows communication- agreeing to disagree, exploring, discovering, creating. Different teaching strategies are used: teacher demonstration, guest speakers, ﬁeld trips, community resources such as museums, libraries, galleries, etc. Brainstorms strategies with colleagues to stretch imaginations and expands student creativity. Advocates for the art student and program.